Creating an environment that is easy to work in and uses the latest advances in ergonomic engineering will always result in a safer and more productive workforce. By making it easier to carry out a task, it is evident that the employee will be able to carry out the task more quickly. One way of boosting the ergonomic efficiency of a workplace is to make extensive use of a flexible working environment by using scissor lifts. There are many different forms of scissor lifts that are used in a wide variety of different tasks. From pallet shifters through to platforms to allow staff access to higher shelves, and even adjustable work benches the list of applications for a piece of simple technology that boosts accessibility is practically endless. One of the most widely used scissor lifts is the standard pallet jack tool. These miniature forklift devices are designed to be as efficient as possible in raising a single pallet off the ground in order to move it from one place to another without the need to resort to using a powered forklift. Pallet jacks use a pneumatic ram pumped by the user to lift the pallet, which is then supported by the scissor mechanism. A more advanced version of the pallet jack is the pallet server. This is a more powerful version that is the intermediate between the jack and a full forklift. It can carry up to 4000lb of weight, and is secure in use thanks to the efficiency of its design. Perhaps the most useful application of the scissor lift in the workplace is in tables and workbenches. By utilizing the design and creating a flexible working environment, a person can examine and handle a large and bulky object such as an engine or other major component at a comfortable level, constantly adjusting the height of the table in order to ensure the best possible accessibility. A work bench which makes the work easier to carry out will reduce the amount of time that the task will take to carry out and improve the workflow. A related scissor lift application to an adjustable work bench is a work platform. Instead of moving the object relative to the worker, the lifting platform raises the worker. When you are in an environment where your staff are working with very large structures such as trucks and buses, being able to quickly access high up areas that would otherwise require a fixed platform supported by scaffolding will save a great deal of time using a portable powered lift. Ergonomics is the science of movement. When we apply ergonomics to material handling applications, we improve the quality of workplace environment, and we create new systems that improve process flow, reduce the liabilities associated with industrial accidents. Often as well, electric hydraulic scissor lifts will be buried in the ground in order to secure and stabilize tractor trailers during loading and unloading procedures. Commercial & Industrial Ergonomic Heavy Duty Electric Hydraulic Lift Tables provide an ergonomic solution to the man y workplace traumas and injuries that can result from repetitive motions, bending, and lifting. They are also very efficient tools for improving process flow. Ergonomic Electric Hydraulic Heavy Duty Lift Tables! Lifting tables are the ergonomic solution to reducing repetitive motion injury, increasing morale, and maximizing material handling process flow efficiency. Carousels are highly utilitarian tools that ergonomically protect worker safety while simultaneously protecting equipment. They represent a very sound investment for any company whose personnel routinely work around scissor lifts, workbenches, or designated workspaces on the warehouse floor. 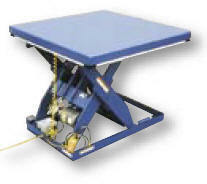 Tables provide unparalleled ergonomic support in lifting, palletizing, loading, and unloading applications. Carts are raised or lowered with either a 12V DC powered motor or a manual two-speed foot pump.